Do you have concrete that has sunken? Over time concrete that was poured over poorly compacted soil will tend to sink as the ground beneath it settles or erodes. In some cases we have seen concrete in Wagoner that will also crack if the ground below it has settled unevenly. Slab jacking is the practice of repairing the sunken concrete by floating it back up to its original position. Level Up Foundation Repair will repair your sunken concrete by injecting a mixture of sand, cement and other additives through small holes in the surface of the concrete. This mixture fills in the space below the concrete slab, raising it up to its original height. In most cases, a slab jacking job can be completed in just a few hours. Compared to laying a new slab of concrete, slab jacking saves you both time and money. First we drill tiny holes through the surface of the slabs to be leveled. 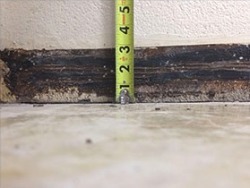 Slab jacking is approximately half the cost of replacing the concrete. Perhaps best of all, there is no wait time to begin using your newly restored concrete surface! 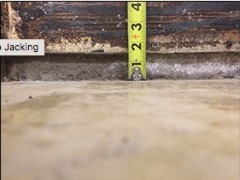 Slab jacking can be used to repair sunken concrete, patios, basement floors, sidewalks/walkways, concrete driveways, concrete pool decks and steps for homeowners. We can also restore leaning chimneys and sinking home foundations. At Level Up Foundation Repair, we can handle just about any slab jacking job across Oklahoma. Level Up Foundation Repair in Wagoner. Slab Injection Foundation Repair Contractor in Wagoner, Oklahoma.